Compact performance. 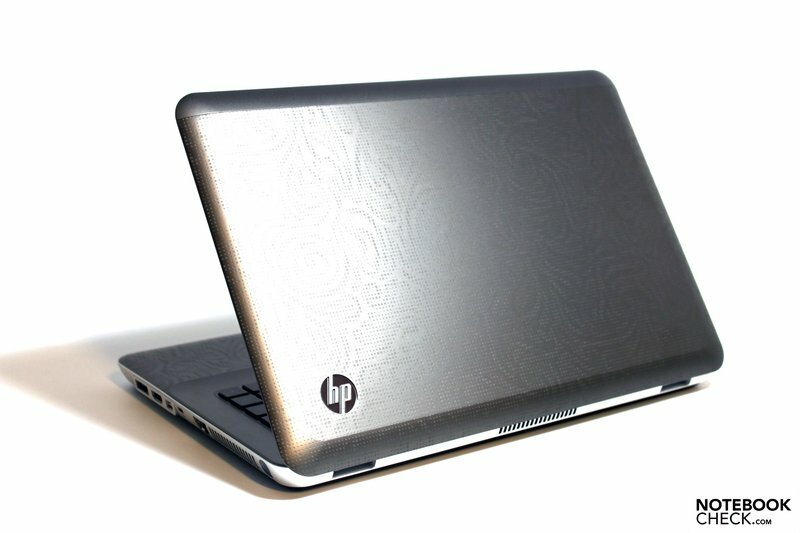 With the 14.5-inch Envy 14, HP has managed to squeeze some powerful components into a slim and stylish chassis--particularly if you opt for a model like this one, with a quad-core, 2nd-generation Intel Core i7 processor. It is also equipped with a midrange graphics card from AMD, which is switchable to integrated graphics when longer battery life is required. So, is this the perfect traveling companion? Not entirely. Keep reading to find out why. 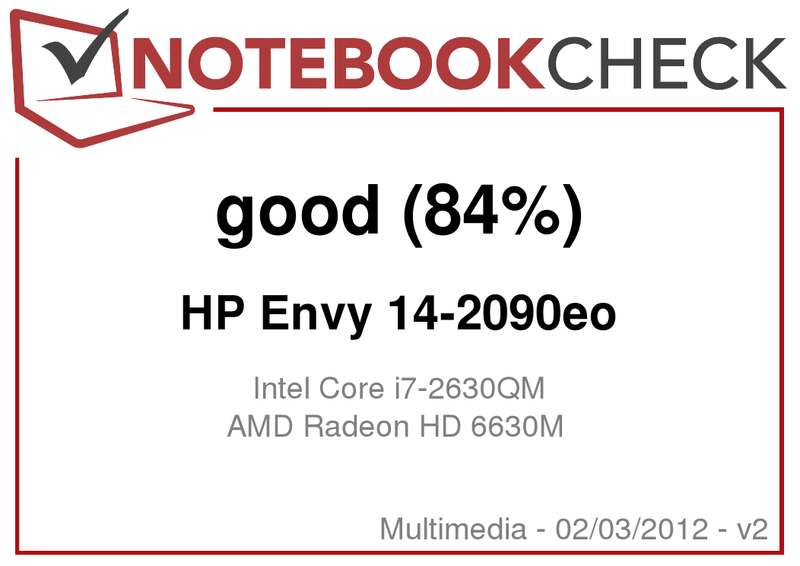 The HP Envy 14 has been represented here on Notebookcheck before. Twice, in fact, in the shapes of the Envy 14-1010eg and Envy 14 Beats Edition. This model's design is largely identical to the 1010eg and has been covered in detail previously. Therefore we will focus on the hardware side in this review. 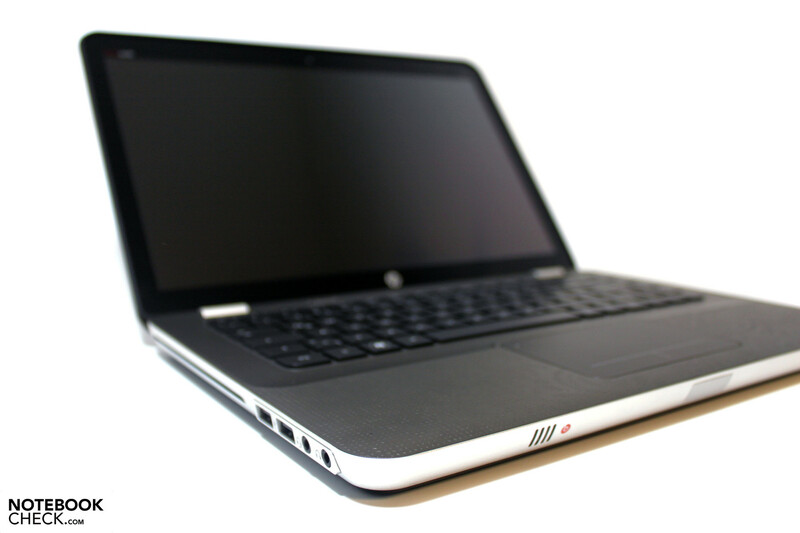 Most notably, the earlier models of the Envy 14 came with a dual-core Intel Core i5 processor from the Arrandale family. In this case, however, there is considerably more (theoretical) power under the hood in the form of the newer Sandy Bridge Core i7 2630QM--a quad-core CPU clocked at 2.0 GHz that dynamically overclocks to 2.9 GHz in some situations due to its built-in Turbo Boost feature. The graphics card has also been updated from a Mobility Radeon HD 5650 to an AMD Radeon HD 6630M, but in this case the actual improvements are more modest. In terms of memory and storage, this newer model is also better equipped out of the box, with 8 GB of DDR3 RAM and a 750 GB hard drive. Besides the dedicated graphics card, this notebook is also equipped with AMD's version of switchable graphics. It can be configured to automatic or manual switching in the computer's BIOS. The AMD solution is not as seamless as Nvidia's Optimus technology, but is nevertheless an important feature that lets you switch to the power-efficient integrated Intel HD Graphics 3000 when the notebook is running on battery power. Another important change compared to previous models of the Envy 14 is that one of the 3 USB 2.0 ports is now a USB 3.0 port. Unfortunately, the overall impression of this laptop's exclusive design and solid build quality is hampered by a low-end panel. Instead of one of HP's higher-end "Radiance Infinity" displays, the Envy 14-2090eo has been equipped with a standard-issue, glossy "HP BrightView" variant with a resolution of 1366x768. Although it is LED backlit like most displays on the market today, the name is contradictory--this display is not very bright at all. With an average brightness of just 175 cd/m2, this panel is squarely in the low end if what is available today. A consequence of the poor backlighting is that you may need to increase the gamma setting to compensate, which worsens the appearance of washed-out colors. At the same time, the reflective surface ensures that outdoor use is impractical at best. Needless to say, the display cannot compete with the Radiance display in the Envy 14-1010eg. 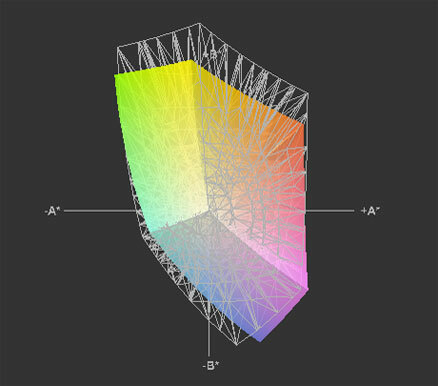 It also has problems keeping up with the color space in the previously reviewed Envy 14 Beats Edition, which also produces a slightly higher average brightness level (177.9 cd/m²). 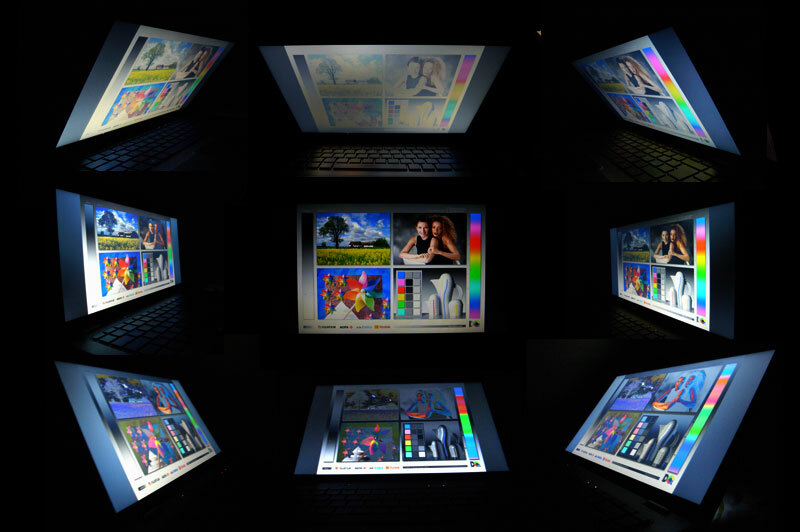 The display in the 2090eo does, however, outperform the color space in the competing Dell XPS 14z, although the latter also offers somewhat better average brightness (181.3 cd/m²). Its viewing angles do little to help the overall impression of the display. Colors quickly become distorted or washed out when the display is tilted vertically--even at relatively small angles. 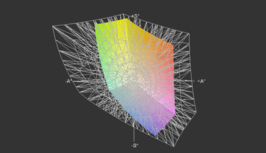 Tilting it backwards quickly inverts the colors as well, while tilting it forwards results in color bleaching. The horizontal viewing angles are better, if far from perfect. Although Intel recently updated the entry-level quad core notebook processor lineup with slightly improved clock frequencies (e.g. the Core i7-2670QM), the Core i7-2630QM is still a very fast mobile CPU. Thanks to Intel's HyperThreading technology, the processor can handle eight threads simultaneously across four physical cores, giving it ample processing power in multi-threaded applications or when running many programs at once. This is a major improvement over the previous Arrandale CPUs and also over the dual-core Core i5 CPUs from the same family (Sandy Bridge). Just like the processors from the Sandy Bridge lineup except for the Core i3 models, it also uses Turbo Boost technology to dynamically increase the clock speed on demand. This means that the base 2.0 GHz clock is automatically increased to as much as 2.9 GHz in single-threaded applications. It can also be increased in 100 MHz intervals in-between, depending on its current load. Since the processor is manufactured in the 32nm process, its power consumption stays at a reasonable level in spite of the core count (45 Watt TDP), although it is more power-hungry than its dual-core counterparts (35 Watt TDP). The maximum power consumption also includes the integrated HD Graphics, which is now integrated on the chip itself unlike earlier revisions. It is quite uncommon to find such a powerful, quad-core processor as the Core i7-2630QM in a 14-inch laptop. Usually, laptops smaller than 15 inches are equipped with dual-core CPUs to keep the heat and power consumption to a minimum. The Envy 14 nevertheless handles these performance reserves well, without putting out an excessive amount of fan noise or heat. 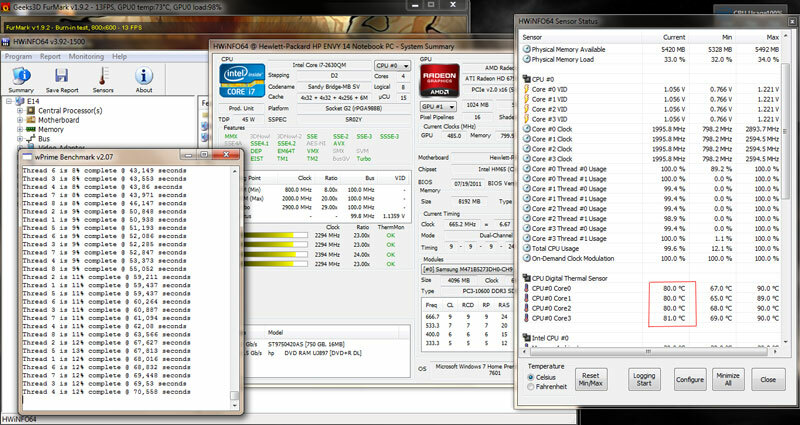 We were for some reason unable to reach the full 2.9 GHz Turbo Boost frequency as measured by Intel's monitoring tool. Single-threaded runs of Prime 95 and Super Pi instead maxes out at 2.8 GHz. In single-threaded use, the difference compared to a dual-core Intel processor operating at the same clock frequency is small to non-existent. However, as soon as the laptop starts handling several tasks at once (including multiple browser windows/tabs) or run programs or games that are optimized for multi-core use, the difference is vast. For instance, the Cinebench R10 score for 64-bit multi-threaded rendering was 16801 points for the Envy 14-2090eo, compared to 8773 points for the Envy 14-1010eg with the Core i5-560M--nearly a doubling. These performance reserves will become quite evident when multitasking. 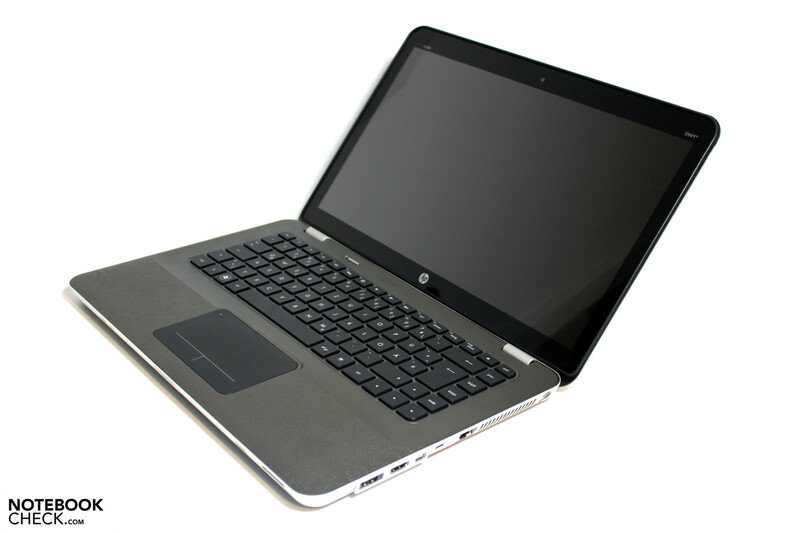 The graphics card in the later models of the HP Envy 14 has been upgraded from the ATI Mobility Radeon HD 5650 to the AMD Radeon HD 6630M (both from AMD). The HD 6630M has 80 more shaders than the HD 5650, but the clocks are low compared to the other cards in the 6600M / 6700M series and the improvement is therefore quite small. It is also equipped with 1 GB of DDR3 video memory instead of the speedier GDDR5 variant present in for example the HD 6770M, but it should still outpace its predecessor. The clocks are 480 MHz for the graphics core and 800MHz for the memory. Also see our benchmark list for reference. Like its predecessor, this is a more powerful card than what you usually find in this form factor and should be capable of playing most or even all current games, even though the settings will have to be lowered considerably in demanding titles. As previously mentioned, the dedicated GPU can also be switched to the integrated Intel HD Graphics 3000 to limit power consumption. The can be done either automatically or manually; it is preset to switch automatically (similar to Nvidia's Optimus technology), but this can be changed in the laptop's BIOS if you require manual control or experience compatibility issues. The switching solution from AMD is not quite as mature as Optimus, but it gets the job done even if the process is slightly less streamlined. The Windows Experience Index is an inaccurate tool for assessing PC performance, but it may provide a rough estimate of how individual components measure up. In this case, the Envy 14 under review is inevitably capped at 5.9, which is the maximum score for mechanical hard drives--only SSDs are allowed to score higher. The remaining scores are obviously quite good, but again it is a very imprecise assessment. For example, the HD 6630M is incorrectly classified as faster than the HD 6770M. While the graphics performance provided by the Radeon HD 6630M is not sufficient to compete with some of the more powerful cards in the HD 6600M series, such as the HD 6770M found in the HP Pavilion dv7-6b02eg, it is still well above the category average in the small form factor segment. Compared to Nvidia's lineup, it is placed somewhere between the GeForce GT 520M and the GT 540M. Futuremark's 3DMark benchmark suite is partly affected by the CPU. 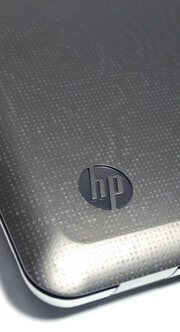 This can be seen, for example, in the Dell Vostro 3550, which is also equipped with the 6630M but a dual-core Intel CPU. The benchmark results are also better than the corresponding ones for the Envy 14 with the HD 5650--especially in 3DMark Vantage. 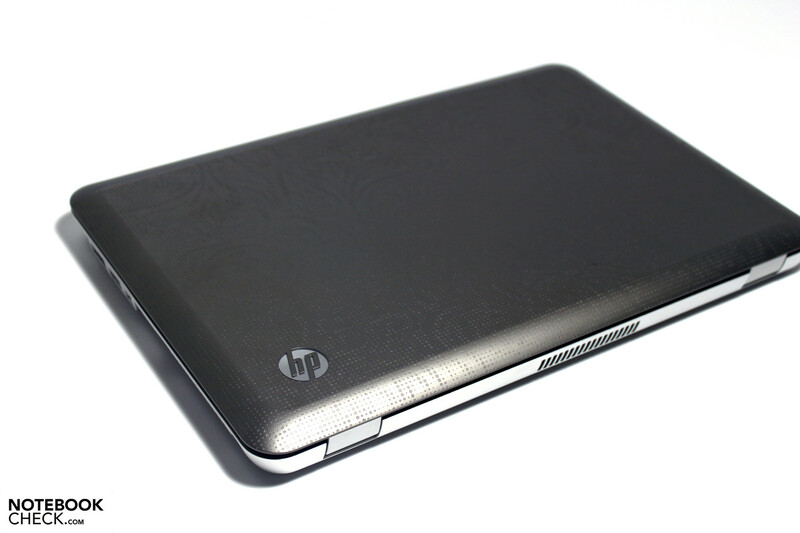 HP has equipped the Envy 14 with a fast 7200rpm hard drive with 750 GB of storage space. Slightly more than 20 GB is reserved for a recovery partition. While this is a good safety measure and seemingly insignificant in such a large drive, it is likely something that you would want to keep in mind and remove if you were to upgrade the hard drive to an SSD. The hard drive is a Seagate Momentus ST9750420AS, which is one of the speedier conventional drives on the market thanks to its higher rotational speed of 7200rpm (compared to 5400rpm, which is common in budget laptops). According to HD Tune, the average data transfer rate is 94.5 MB/s, which is very good for a mechanical hard drive. It peaks at just over 120.2 MB/s. In comparison, a modern solid state drive peaks at over 500 MB/s, but is considerably more expensive. In our stress test, using Furmark and wPrime simultaneously, the processor does not exhibit throttling. In fact, since the highest fan mode kicks in quite early under this extreme load, the CPU temperatures manage to stay around a constant 80 degrees C. However, the CPU's Turbo mode cannot reach 2.9 GHz, even in single-threaded tests. Instead, it hovers at 2.8 GHz at most. On the whole, there are few laptops in this size and weight class that can compete with this configuration of the Envy 14 in terms of CPU performance. Quad core processors are usually reserved for 15.6-inch or larger laptops such as the Acer Aspire 5755G, which gets a comparable PCMark Vantage score. Another benefit is the addition of a dedicated midrange graphics card that should suffice for casual gamers. At the same time, no compromise has been made on the battery life due to the integration of switchable graphics. 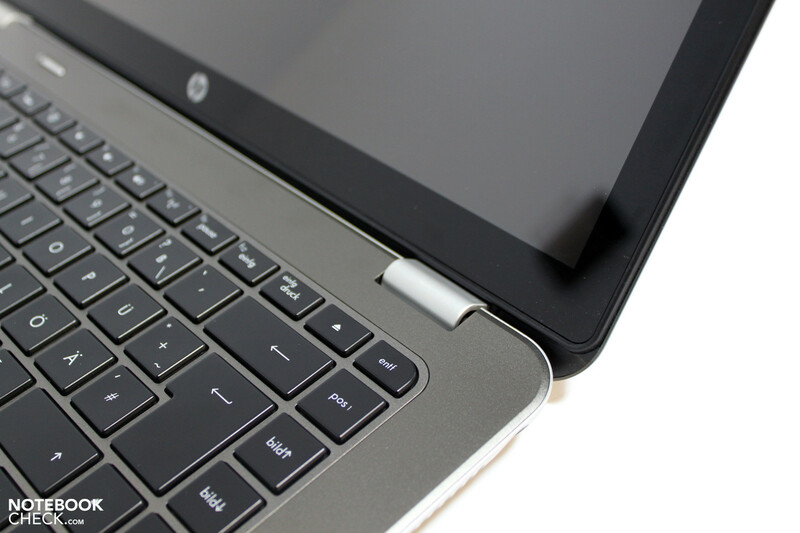 The PCMark scores of the Envy 14 suffer when compared to other small laptops with a solid state drive, which greatly affects the result (as well as overall system performance). Although the Envy 14 is not a gaming laptop by any standard, the combination of a fast processor and the AMD Radeon 6630M GPU merits a few gaming tests. Bethesda's latest role-playing masterpiece requires no lengthy introduction. Since the game uses DirectX 9 for rendering, it isn't particularly resource intensive, but to tune the visuals to higher settings you need a reasonably fast graphics card. Skyrim is fully playable at the medium preset, but it should be added that the presets are not necessarily optimal for the 6630M--post processing effects are not its strong side. By turning off antialiasing and anisotropic filtering altogether, the game's drawing distances can be set to their maximum values while retaining an average 45 fps. Nevertheless, the Envy 14-2090eo can be compared even with the Asus U46SV (GT 540M) in Skyrim frame rates. Unlike Skyrim, the latest iteration of DICE's popular shooter is very demanding for everything but the most powerful gaming laptops with high-end GPUs. The test consists of a single-player mission--multi-player battles are probably even more demanding. Interestingly, the game auto-detects to "high" settings, which is way too much for the Envy 14's graphics card. Only with the default "low" preset and lower resolution does the game exceed the healthy 30 fps average. The new Deus Ex makes use of DirectX11 features such as tessellation, but it is still not overly challenging for the GPU. It is playable at native resolution and the game's default setting, which includes DX11 tessellation. Only by increasing the settings and adding 16xAF does the average frame rate drop to an unacceptable level. It is faster than the GeForce GT 520M in the Asus U36SD, but not as fast as the GT 540M in the Acer Aspire 3830TG, but that matters little as long as it remains perfectly playable. Crysis 2 starts to become really demanding once you start adding DirectX 11 effects and high-resolution textures. However, in its original DirectX 9 version it still looks good but doesn't require a desktop SLI setup to work. The high-res texture pack and DX11 version is out of the question for the HD 6630M. The game is (just barely) playable at the games default "high" setting (actually the minimum setting) and native 1366x768 resolution. Even then the frame rate dips into the lower 20's on occasion. Compared to other laptops, the performance in Crysis 2 is roughly on par with the AMD-based Pavilion dv6 (Llano platform). Far Cry 2 has been around for a while now and gets to represent slightly older games in this test suite. The game includes a built-in benchmark tool, which is a welcome feature that makes it easier to assess performance across different quality settings. The game is easily playable in the tested settings and can be tweaked further to get even better visuals. Gaming is not the primary purpose of this laptop, but the Envy 14 and its Radeon HD 6630M manages quite well in the tests. Avid gamers should look for a laptop with a more powerful graphics card, but for casual players who only play games every now and then, the Envy 14 should be more than sufficient. By tweaking the game settings, most if not all current titles should be playable with the Radeon HD 6630M, but rarely with high settings. 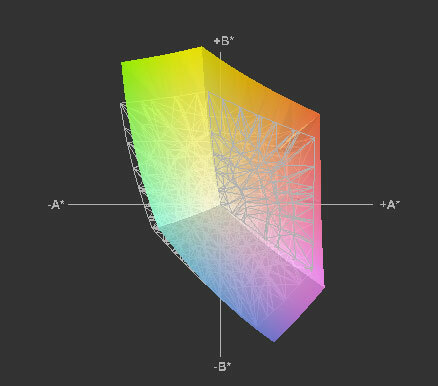 The low resolution of the display (1366x768) helps more games run in native resolution, which is always the best option from an image quality perspective. Older titles should pose no problems whatsoever for the Envy. Taking into account the high-end quad core processor placed in such a small and tight chassis, the noise level is surprisingly low. Under heavy load the system unsurprisingly goes into a much louder state, but it is not high-pitched or otherwise annoying. This highest state is only reached in extreme situations, such as when playing games that make full use of both processor and graphics card. Even when taxing the system with demanding applications, the fan only occasionally goes into high-speed mode. During general use, the laptop stays reasonably quiet at all times. Although the fan is never entirely turned off, it is not disturbingly loud at the lowest setting and the second-lowest setting is not much worse. There are several steps between the lowest and the highest setting, which is an additional plus. By and large, the Envy 14 doesn't put its fan to use when there is no need for it. The slot-loading DVD drive is not particularly quiet, as these things seldom are. I makes quite a bit of noise when spinning up and reading/writing data, but it is less disturbing during movie playback. 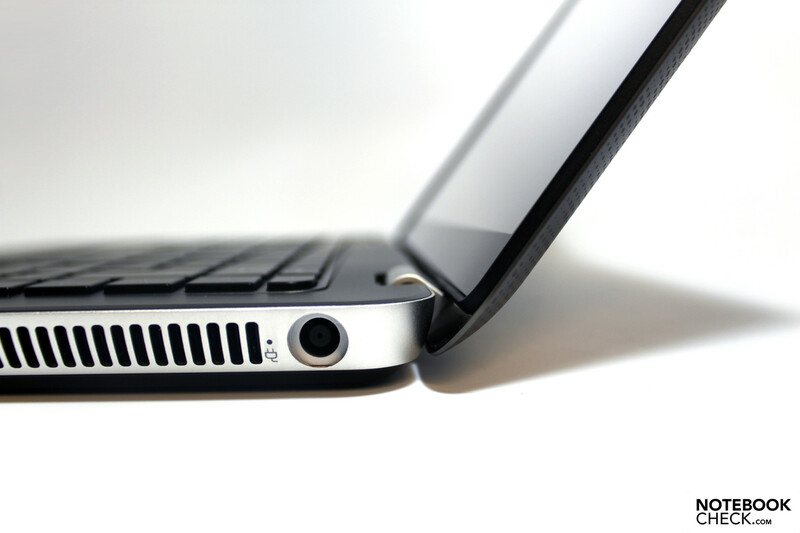 The cooling solution in the Envy 14 consists of a single fan accompanied by a single vent on the right-hand side of the laptop. For obvious reasons, this is also where most of the heat gathers during use. The right side is consistently warmer than the left, but this is never uncomfortable during light use. In contrast, during heavy load--when the processor reaches approximately 85 degrees C--the temperature on the bottom side close to the vent can rise above 40 C, but that nevertheless means that the laptop vacates heat very efficiently. Furthermore, the keyboard and palm rest areas never become uncomfortable to use. In fact, they consistently stay below body temperature.. As long as the notebook stays on a flat surface, there appears to be no risk of overheating or throttling during heavy multi-core use. Still, we were only able to reproduce a maximum Turbo Boost frequency of 2.8 GHz, or around 100 MHz below the advertised Turbo Boost maximum. 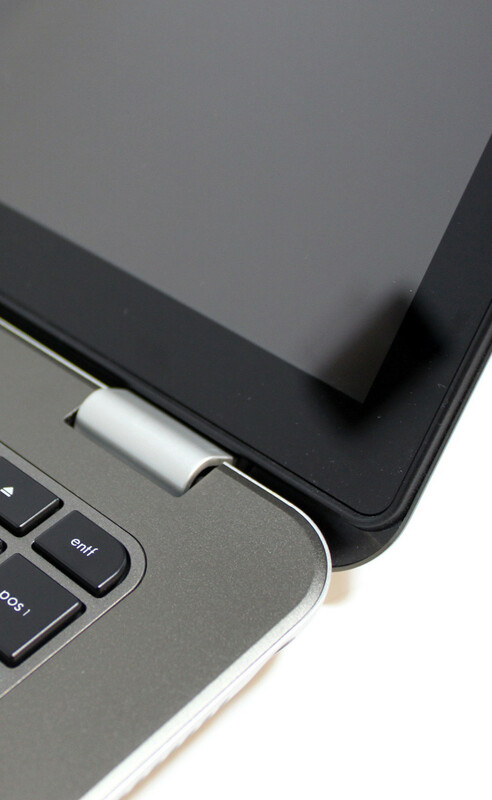 Due to the quad-core Core i7 CPU, the battery should not last as long as the Envy 14's dual-core counterparts. This is evident when the laptop is put under maximum possible load with both the processor and dedicated graphics card constantly running at full capacity (an unrealistic scenario for most users). Here the laptop stays alive for 53 minutes, compared to 66 minutes for the Core i5 CPU. However, thanks to the switchable graphics feature and likely in part because Intel's HD Graphics chip is now integrated on the die itself (and manufactured in the same 32nm process), the laptop's endurance during minimal load is actually much better than with the previous model's Core i5-560M (4h 31min). The "Idle" test is measured with Battery Eater "Reader's Test" and simulates reading a text document with minimum brightness and maximum power-saving measures (no WLAN). The "Surfing with WLAN" test is more realistic; display brightness is lowered by two steps from maximum and the web browser is set to change websites frequently and load sites with various types of content. When equipped with a quad-core Core i7 processor as well as a Radeon HD 6630M graphics card, there is no question that the Envy 14 is exceptionally powerful for its size. Compared to other notebooks with equivalent hardware, the Envy 14 is also relatively affordable. It's a pity that HP had to use such a low-end display to keep the price down. The portable format, powerful components and high quality build would have made it a great choice for power users looking for a convenient form factor, but the display quality will be a major issue for many prospective buyers. 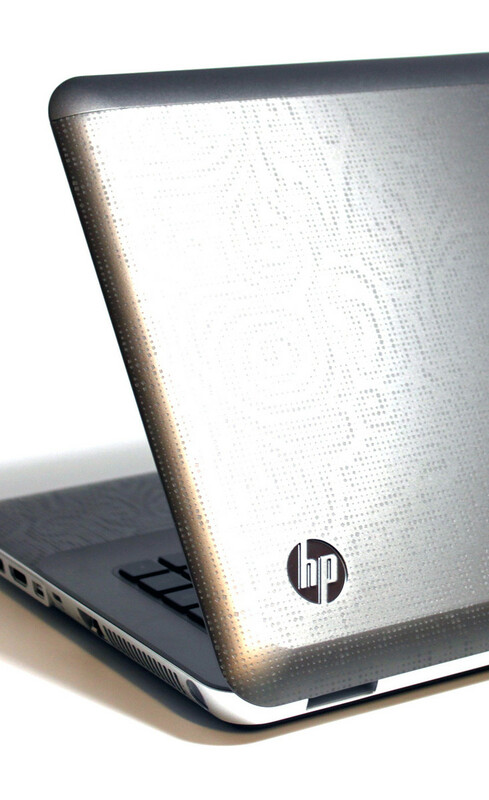 HP has apparently learned from past mistakes in the latest Envy 15, which is equipped with a high-end IPS panel. Early revisions of the Envy 14 were also available with higher resolution (1600x900) panels, but this option is not present for this model. 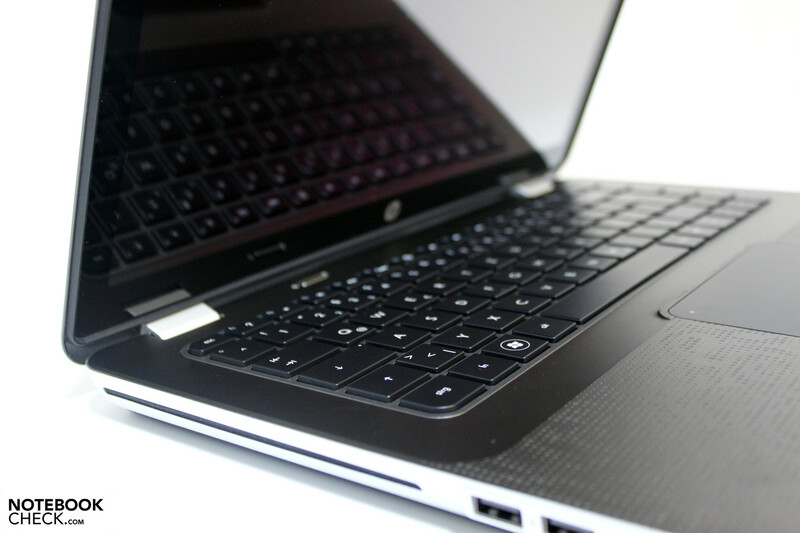 Apart from the budget display, the Envy 14 is a very attractive notebook. The design remains largely unchanged from the earlier models, with the exception that a backlit keyboard has been added--a both practical and aesthetically pleasing feature. The fact that the hardware is so potent and that the GPU can keep up with most of the latest games are another couple of points on the plus side. On top of that, it also comes with switchable graphics that gives the Envy 14 good battery life by switching to the integrated GPU to save power. On the whole, it is really only the display that detracts from the overall impression. 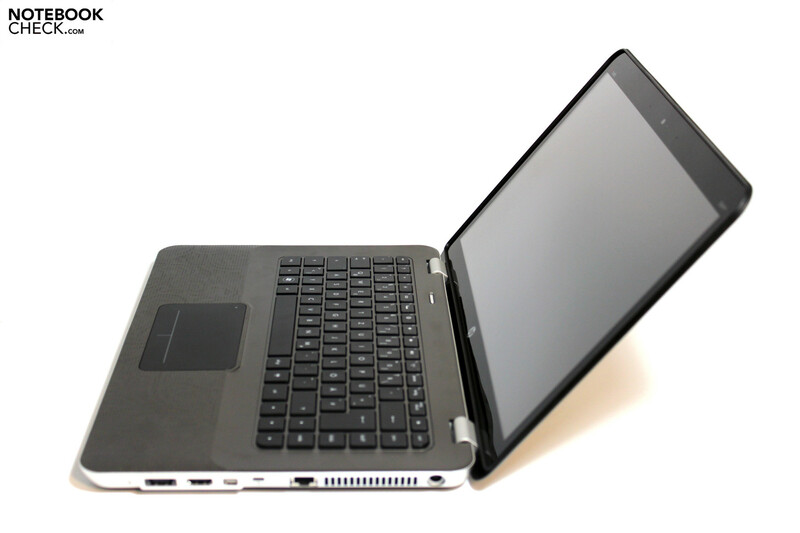 The Envy 14-2090eo is a powerful and versatile laptop in a small form factor. 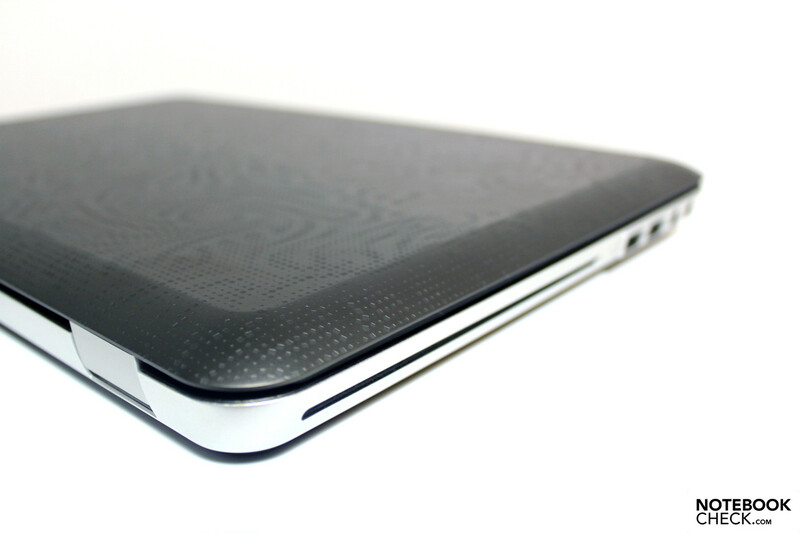 At the same time it offers a more than decent battery life thanks to switchable graphics. HP does not impress with the choice of display. The low-end panel does not match the laptop's otherwise striking appearance. It is a positive surprise that the included Radeon HD 6630M is capable of playing most current games. One of the Envy 14's closest competitors is the Dell XPS 14z--also a "premium" laptop but equipped with a graphics solution from Nvidia.